From my perspective as an African American, the month of February can be enlightening, inspiring and painful at the same time. I’m not sure if I understand the words “black history?” When I say them, they evoke feelings of separateness from the totality of human truth. It’s carved out and deliberate but only special in terms of its place on the calendar. For me to review black history is not only an acknowledgement that African Americans helped build this country with many great contributions, but that some of those courageous efforts were soaked in bloody oppression. I don’t want to dwell on this stuff, but it always floats to the top if one looks honestly. When I look at black history, I see a struggle that is linked from the chained slaves aboard slave ships to the modern day African American who is supposed to be “free” – who may get up and look at themselves in the mirror and think they have it better than the generations before them. 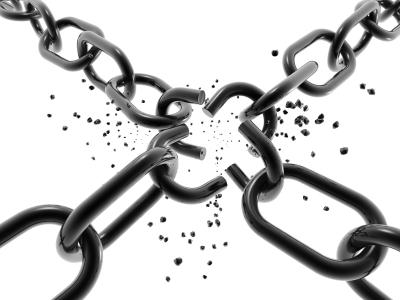 But deep down, they still see the commonality between themselves and their chained forebears, people that were fastened to their station in life with little to no hope of escape. From that point of view, I see a history littered with civil rights icons and people that have struggled even to their very deaths to see justice. And so I ask, why have many of the people recognized in black history month had to be tempered in the hot oven of oppression? Why? I keep asking myself this, but whatever answer I come up with is wholly unsatisfying because it ends with more questions. My thought is, don’t separate black history from human truth, because the fact is history isn’t clean, and can’t be. We learn by seeing the totality of the picture, not just a portion or what we feel is acceptable. Make no mistake, if we digress from honesty we fool ourselves into thinking past events are far removed from the present, and we doom ourselves to struggle and mediocrity. Black history can’t exist without white history and how they have played against each other. If we don’t accept our shared history of privilege and oppression, we will never know ourselves as a community, nor will we end poverty. We can’t look at black history without examining the connections to the white world around us, its beauty, sacrifice and brutality. February is black and white history month, right? 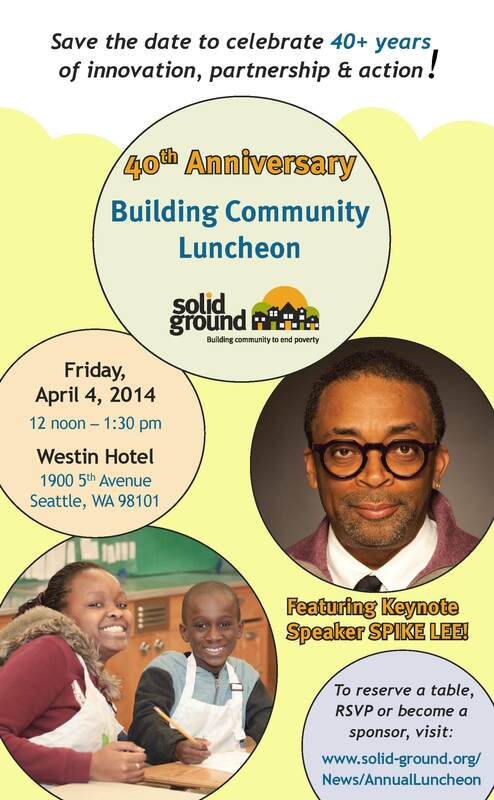 Join us for Solid Ground’s 40th Anniversary Building Community Luncheon on Friday, April 4, 2014 from noon–1:30pm. This year, we’re honored to host Spike Lee as keynote speaker. With a body of work that spans four decades, he has written, produced, directed and acted in countless films that illuminate the impacts of racism in our country. As one of the most outspoken African-American voices, he talks candidly, and with authority, about issues of race in mainstream media and Hollywood, using as a backdrop a rare behind-the-scenes look at his celebrated body of work. And as an organization working to undo racism and other oppressions that are root causes of poverty, Solid Ground is pleased to bring such an influential person in the conversations about race and social justice to our event. At this year’s Luncheon, we will also come together to celebrate 40+ years of building community to end poverty. We’ll highlight Solid Ground’s 40-year culture of innovation, partnership and action – a culture that has created some of our community’s most effective anti-poverty programs. We will lift up individual stories of leadership and courage, and discuss our plans for the future. Register here for the Luncheon! Visit our Luncheon webpage to reserve a table, RSVP or become a sponsor. Click here for more information about Spike Lee. Starting in 2001, Solid Ground began sending staff members through a transformational training created by the People’s Institute for Survival and Beyond called Undoing Racism® (UR). Today, all of our permanent, full-time staff are required to attend. The workshop takes place over two intensive, eight-hour days. Participants learn the history of racism in the US and reflect on how that legacy continues to play out in our society and institutions. The UR training also hits deeply personal chords, and each individual takes away different learnings based on our racial/ethnic and socioeconomic background, gender, age and life experiences. As human service providers, the training helps us examine the connection between racism and poverty, and identify ways we can work to remove some of the barriers people face in accessing our services and other community opportunities. A wide spectrum of the Solid Ground community participated in the UR workshop in December 2012, including: line staff and managers from all of Solid Ground’s various locations; a Board member who once served as an AmeriCorps Member through Solid Ground; current AmeriCorps Members who also have accessed Solid Ground services; and our agency’s two top leaders – Gordon McHenry, Jr., President & CEO, and Sandi Cutler, COSO (Chief Operating & Strategy Officer). The People’s Institute welcomes past workshop attendees to retake UR for free – so some of us were experiencing it for a second or third time, while for others, it was a first. Grant Writer Roshni Sampath joined Solid Ground in July 2012 and was drawn to the agency, in part, because of our stated anti-racism values. This was her first UR training. I joined Solid Ground in 2001, and my current role is Web Administrator & Publications Specialist. As a college-educated white woman from a middle class background, the UR training gives me a basis to understand that I have access to opportunities and unearned privileges – and that these benefits affect how I walk in the world and impact those around me. UR gives me tools to begin to examine my privilege so I can attempt to use it to undo instead of reinforce oppressions. As a part of Solid Ground’s Communications team, I need an awareness that my learned dominant culture perspective is not the end-all, be-all. I want to be held accountable for the way I communicate about our work and how I share people’s stories. I recognize the delicate balance between helping to give voice to someone who may feel disenfranchised versus “exploiting” or invading someone’s privacy in the name of telling a powerful story to benefit Solid Ground. UR has taught me to question both my own motives and how I approach my work. This lesson really hit home during the Dec. 2012 UR thanks to the active participation of two Washington Reading Corps (WRC) AmeriCorps Members who also live in Solid Ground’s permanent housing at Brettler Family Place. These confident women gave candid feedback about their experiences as Solid Ground “clients” who are now giving a year of service to the agency, and how they have struggled to assert their voices and self-determination along the way. Originally from Jordan, Mona Bayyuk moved to the US with her family as a teenager. She was just a few days into her Case Manager position with Seattle Housing Stabilization Services when she attended UR. She says, “It was definitely a huge eye opener, because although I had attended diversity courses in both my undergrad as well as graduate studies – and discussed as well as addressed the implications of being from a minority group and the effects of racial profiling – we never addressed ‘race’ and its impact on individuals. Roshni sums up the importance of UR Principles in simple terms. “These ideas,” she says, “we live our lives in them.” And I have to agree with her: Undoing racism is never done; it’s a lifelong process that embraces and affirms our humanity if we choose to embrace and commit to the work. Solid Ground’s February Groundviews newsletter and Big Picture News insert highlight our agency’s Language Access work. The lead article below shows Language Access in action via our HSS (Housing Stabilization Services). To read past issues of Groundviews, please visit our Publications webpage. Through her health clinic, Laura learned about Housing Stabilization Services (HSS), a Solid Ground program that provides financial and housing search support to Seattle-area people who would very likely lose their housing without the assistance. HSS helps people either hold onto housing or find a place to live, and prevents the spiral into homelessness. HSS also highlights our Language Access efforts in action: Through HSS, Laura connected with a Spanish-speaking case manager, Pamela Calderón, who is originally from Bolivia. Laura says, “I always try to speak a little English, and I always ask questions, because I like it and I want to learn it.” However, when it came to the stressful process of searching for a place to live in a hurry, the opportunity to work with a case manager in her own language was invaluable. Laura now has a steady job with good hours. Her new housing is located in a brand-new, mixed-income apartment building with community spaces and resources for residents. For more info, visit the HSS (Housing Stabilization Services) webpage, or contact Pamela Calderón at pamelac@solid-ground.org or 206.694.6841. Click more to view this article in Spanish! Harris-Perry, a longstanding political analyst and contributor to MSNBC, is a frequent guest of PoliticsNation with Rev. Al Sharpton, and also serves as occasional host of The Rachel Maddow Show and The Last Word. Beginning mid-February she will host her own show (as yet unnamed) on MSNBC on Saturdays and Sundays from 10am – 12noon. Harris-Perry “take(s) on the most-challenging issues of the day with the kind of sophisticated sass and vigor that is often lacking on mainstream television,” according to NewsOne for Black America. An award-winning author and columnist for The Nation, Harris-Perry is also a professor of political science at Tulane University, where she is founding director of the Anna Julia Cooper Project on Gender, Race and Politics in the South. Her latest book is called SISTER CITIZEN: Shame, Stereotypes, and Black Women in America – For Colored Girls Who’ve Considered Politics When Being Strong Isn’t Enough. Luncheon guests will be treated to Harris-Perry’s warmth, intelligent humor and sharp analysis. For a preview, check out this clip from her January 9, 2012 appearance on The Colbert Report. Luncheon sponsors and table hosts will be invited to a special Q&A session with Harris-Perry following the event. For more information on sponsoring or hosting a table, contact Megan Locatelli at 206.694.6862 or meganl@solid-ground.org.